35 Fairfield is located on the west side of Fairfield, between Commonwealth and Newbury, with 33 Fairfield to the north and 37 Fairfield (239 Newbury) to the south. 35 Fairfield was built in 1877-1878 for banker and real estate investor Asa Perkins Potter, one of eight houses, four on each side of the block: 31-33-35-37 Fairfield on the west and 32-34-36-38 Fairfield on the east. He and his wife, Delle (Sheldon) Potter, lived at 29 Fairfield, built at about the same time. Click here for an index to the deeds for 35 Fairfield. On March 6, 1879, Asa Potter sold 33 Fairfield to Silas Merrill. 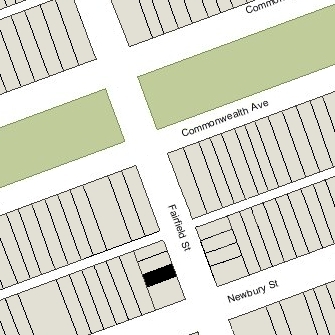 The deed included an easement reserving a three foot wide strip across the western boundary to provide drainage access to the alley for 37 Fairfield. A similar easement was included in the deeds for 31 and 33 Fairfield to provide passage and drainage access to the alley for 31-33-35 Fairfield. On March 6, 1879, 35 Fairfield was purchased from Silas Merrill by tea dealer Herbert Nash. In June of 1879, he married Mary Chafee Baldwin; they made 35 Fairfield their home. He previously had lived at 33 Union Park with his parents, Israel Nash and Deborah Clapp (Briggs) Nash. She previously lived at 10 Union Park Street with her parents, William Henry Baldwin and Mary Frances Augusta (Chaffee) Baldwin. 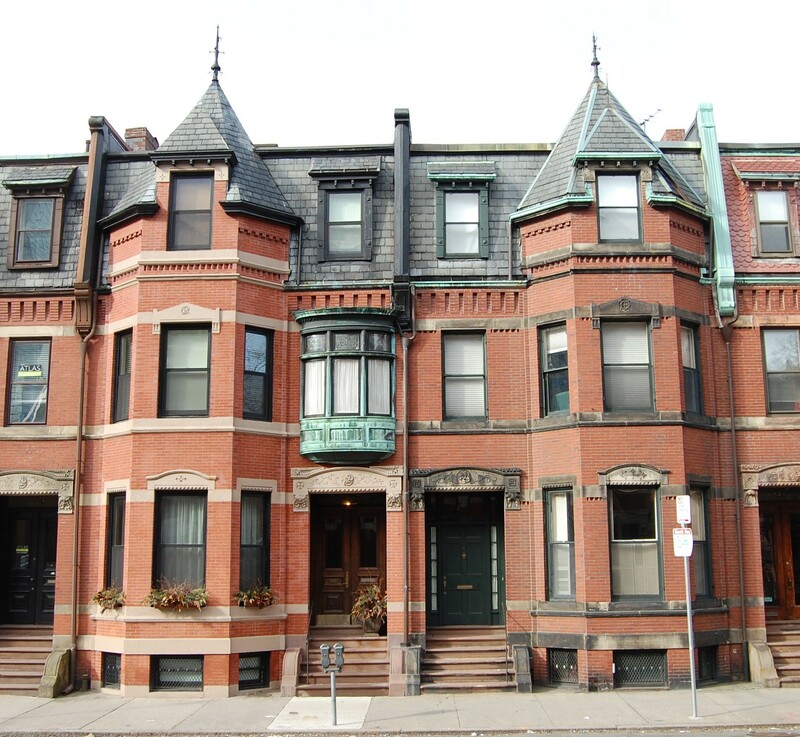 Herbert and Mary Nash continued to live at 35 Fairfield during the 1884-1885 winter season, but moved soon thereafter to 245 Newbury. On December 15, 1884, 35 Fairfield was purchased from Herbert Nash by clothing merchant Ferdinand Strauss. He and his wife, Ida (Cohen) Strauss, made it their home. They previously had lived at the Commonwealth Hotel at 1697 Washington. 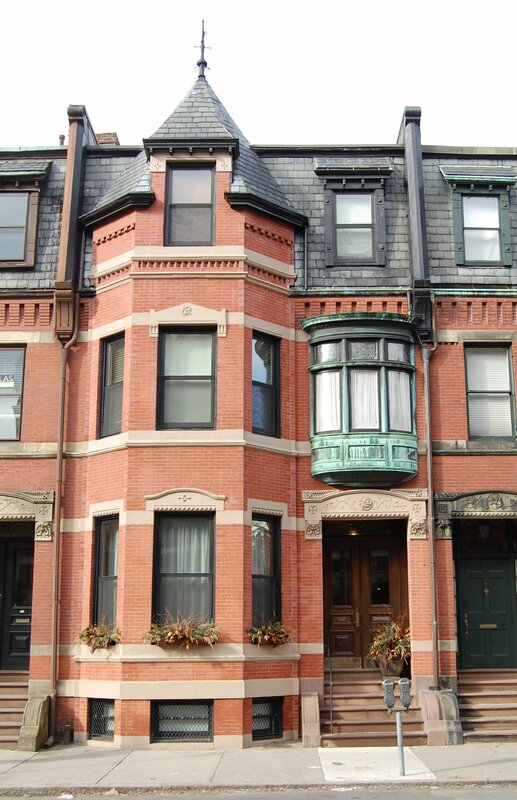 They continued to live at 35 Fairfield during the 1891-1892 winter season, but moved thereafter to Brookline. On June 16, 1892, 35 Fairfield was acquired from Ferdinand Strauss by Asa Haden Caton, a mason and building contractor. On March 31, 1893, 35 Fairfield was acquired from Asa Caton by Mary Elizabeth (Whitcher) Lamson, the wife of Dr. John Augustus Lamson, a physician and surgeon. They had lived at 58 Temple in 1892. On December 13, 1905, she transferred the property into her husband’s name. They continued to live at 35 Fairfield until his death in January of 1912. On June 4, 1912, 35 Fairfield was acquired from John Lamson’s estate by Mrs. Annie Leigh (Ambrose) Congdon, former wife of James Congdon. She previously had lived at 51 Gloucester. Annie Congdon continued to live at 35 Fairfield until her death in June of 1935. In July of 1936, Wesley E. Lindsey filed for permission to convert 35 Fairfield from a single-family dwelling into an insurance office on the first floor and a dwelling above. He was president of the Associated Merchants Mutual Insurance Company and probably made the filing in anticipation of acquiring the property. The application was abandoned. The house was not listed in the 1936 and 1937 Blue Books. On November 27, 1912, 35 Fairfield was acquired from Annie Congdon’s heirs by Gould Morgan Crosby, Inc., interior decorators. Gould Morgan Crosby and his wife, Dorothy (Damon) Crosby, lived at 35 Fairfield and in Marshfield Hills. By 1940, the Crosbys had been joined at 35 Fairfield by his mother, Cora (Morgan) Crosby, the widow of Daniel Crosby. Gould Morgan Crosby Inc. continued to be located at 35 Fairfield in 1942. In 1943, neither Gould Morgan Crosby Inc. nor the Crosbys were listed in the City Directory, and 35 Fairfield was the home of Hilding N. Carlson and his wife, Ethel M. Carlson. They previously had lived in Braintree. He was president of the New England Aircraft School. By 1944, Gould and Dorothy Crosby had resumed living at 35 Fairfield. He served in the US Coast Guard during World War II. On April 15, 1946, the Crosbys transferred 35 Fairfield into Dorothy Crosby’s name. In August of 1946, Dorothy Crosby filed for (and subsequently received) permission to convert the property from a single-family dwelling into a two-family dwelling, indicating that the top floor was for “mother’s apartment,” probably intended for Cora Crosby. It appears that this second apartment became the home of George Crossan Seybolt and his wife, Hortense Edwina (Kelley) Seybolt. They were married in September of 1947 and, according to the September 3, 1947, Boston Globe article on their marriage, planned to make 35 Fairfield their home after their marriage. They later moved to Dedham. He became President and Chairman of the Board of the William Underwood Company, food canners. He also served as president of the Museum of Fine Arts. Gould and Dorothy Crosby continued to live at 35 Fairfield. By 1950, he had resumed his business as a furniture dealer and interior decorator, with offices located at 420 Boylston. Gould Morgan Crosby died in July of 1966. Dorothy Crosby continued to live at 35 Fairfield until her death in July of 1974. In September of 1975, George and Hortense Seybolt purchased 35 Fairfield from Dorothy Crosby’s estate. On August 21, 1978, 35 Fairfield was purchased from the Seybolts by Carroll F. Wales and his sister, Susie M. (Wales) McIntyre, the widow of Harold McIntye. Carroll Wales was an artist and art restorer, specializing in Byzantine art. From 1968 to 1986, he owned Oliver Brothers Art Restoration in Boston. On June 18, 1985, Susie McIntyre transferred her interest in the property to her brother. Carroll Wales lived at 35 Fairfied until his death in April of 2007. In his will, he left 35 Fairfield to Peter A. Boyacoplu of Toronto. In October of 2008, Peter Boyacoplu applied for (and subsequently received) permission to convert the property from a two-family dwelling into a three-family dwelling. On September 1, 2009, Carroll Wales’s estate transferred 35 Fairfield to Peter Boyacoplu. The property changed hands. It remained a three-family dwelling in 2016.